Republished from UNSW Newsroom, 17 August 2016. Article by Clare Morgan. A “witty and naughty” vocal send-up by composer and Head of the School of the Arts & Media, UNSW, Andrew Schultz has won a 2016 Art Music Award. A hilarious vocal send-up of the medical profession has won Head of the School of the Arts & Media Professor Andrew Schultz a 2016 Art Music Award. Professor Schultz won the Vocal/Choral Work of the Year for his comical Le Molière Imaginaire, composed for the eight voices of British a cappella ensemble I Fagiolini. Described as “urbane, virtuosic, cultured, witty and naughty in equal measure”, Le Molière Imaginaire was inspired by the final scene in Molière’s last play, Le Malade Imaginaire (The Imaginary Invalid). It features a musical interlude in which a mock graduation ceremony for a quack doctor becomes increasingly farcical. Professor Schultz shared the award with writer Timothy Knapman, who adapted the original text. The comic romp had its world premiere as part of Musica Viva Australia’s 2015 international concert season. 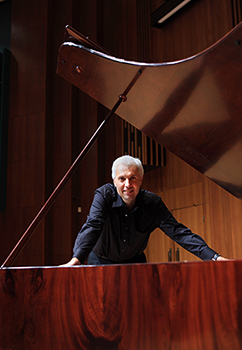 Professor Schultz had a second work nominated in the same category, Paradise, five songs for soprano, cello and piano. The Art Music Awards, presented by the Australasian Performing Right Association (APRA) and the Australian Music Centre, are Australia’s night of nights for musicians based in the experimental, jazz and classical genres. This year’s awards ceremony was held in Melbourne and hosted by Jonathan Biggins.